SAN FRANCISCO (20 June 2016): Eager to emerge from the “trance” and “lack of imagination” plaguing electric guitarists for the past several decades, Corrado Rustici devoted six years to exploring sounds and expansive musical contexts utilizing only the guitar as his field of experimentation and expression. The imaginative results are the nine songs he composed that together form “Aham,” an audacious collection of ambient fusion, progressive jazz, ethereal rock, moody pop, and dramatic classical performed and produced by Rustici set for release in the U.S. on July 15. Rustici’s aural pursuit began in conjunction with a spiritual quest, an existential search into his being, which conjointly led to exploring the essential nature of his perception of music. Everything that you hear on “Aham,” a Sanskrit word meaning “I am,” from what sounds like drums, bass, strings, woodwinds and voice were created exclusively using electric and acoustic guitars through analog pedals and digital plug-ins. The only exceptions are two vocal tracks – one by Rustici on the poetic confessional “The Guilty Thread” and another featuring the soulful tenor voice of Andrew Strong (“The Commitments”) on the fantastical adventure “Alcove Of Stars” – and handclaps on the meandering balladic sojourn “The Last Light Spoken.” The artist did not use synthesizers, samplers or electronic instruments anywhere on the album. “When I started to write the music for this album, I wanted to find out how far this wonderful instrument and I could go. During six years of work and experimentation, I’ve been incredibly surprised by the guitar’s versatility and sonic capabilities , which have been seldom used or almost totally ignored up to this point. The deeper I went, I became more and more enthused and excited about the little and big secrets that the instrument kept revealing to me. The way in which the music was conceived and produced created some limitations, constrictions and a distinctive sonic palette, all of which contributed to the overall sound and mood of the album. I hope that after six years of R&D, I was able to create a musical space within which one can hear the first baby cry of what I like to call the ‘Transmodern Guitar,’” said Rustici, who as a byproduct of his work on “Aham” is designing and developing a couple of guitar pedals with DV Mark that will be unvieled in January 2017 at the NAMM Show. 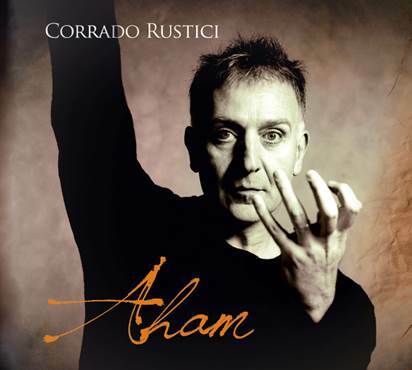 To Rustici, it was important that the songs on “Aham,” including the epic two-part title track opus, connect with listeners meaningfully and are capable of shining on their own merits, and do not simply become guitar demos for his revolutionary techniques and ingenuity. The Naples, Italy native will perform music from “Aham” on home soil in November in support of the album, which Sony Classical is releasing in that territory next month. After leading his own band (Nova) in the mid-to-late 1970s, which included collaborations with Phil Collins and hit-maker Narada Michael Walden, Rustici relocated to California and has been a San Francisco resident since 1978. As an award-winning producer, Rustici helped craft a library of No. 1 Billboard singles in Europe and multi-million selling albums working with global superstars such as Zucherro, Paul Young and Luciano Pavorotti. In 2007, he became the first producer to simultaneously occupy the top 3 spots on the Nielsen chart with three different artists (Ligabue, Negramaro and Renga). Over the years, his passion for sonic innovation has resulted in unearthing now widely accepted and used production methods such as Push & Pull, which combines the irreverent approach of rock and pop with the softer and more evocative effect of ambient music. As a solo artist, his previous releases are “Deconstruction Of A Postmodern Musician” (2007) and “Blaze & Bloom: Live In Japan” (2014), the latter of which was also issued as a DVD. For more information, please visit www.CorradoRustici.com. WOODLAND HILLS (16 June 2016): A year before he escaped communism in his native Romania by walking through the mountains of Yugoslavia and into Greece, the seed of Damian Draghici’s dream was planted when he was just a 17-year-old teenager who snuck into a Bucharest nightclub to watch a set by an American jazz combo. Nearly 30 years later, his vision will finally come to fruition on July 8 when Century Jazz Records issues “The American Dream,” a 13-song disc of standards produced by Dan Siegel and Tom McCauley that showcases the pan flutist collaborating with nearly two dozen jazz, Brazilian and Latin music greats, Grammy winners, icons and top-shelf musicians. Preceding the album at jazz radio is the sultry bossa nova “Ceora,” an exquisite duet with trumpeter Chris Botti. As trumpeter Randy Brecker soloed in the crowed club that 1987 evening, what sparked Draghici’s imagination was recording a jazz album that would feature the tones, textures and the unique voice produced on the hollow-tubed bamboo instrument, the pan flute. “The American Dream” also pays homage to the jazz giants that influenced Draghici’s artistic expression. Twenty years ago, Draghici first arrived in America to attend the famed Berklee College of Music in Boston on a full scholarship, which is where he linked up and began working with a bevy of premier jazz musicians, including drummers Vinnie Colaiuta and Dave Weckl, who keep time on “The American Dream.” The respect Draghici garners from his musician peers helped him attract an impressive list of guest soloists who perform on the collection, including Botti, trumpeter Arturo Sandoval, clarinetist Eddie Daniels, Grammy-winning pianist Michel Camilo, Grammy-winning vocalist Luciana Souza and Grammy-winning guitar virtuoso Frank Gambale along with a stellar ensemble of internationally-renown players such as Siegel, Stanley Clarke, Brian Bromberg, Russell Ferrante (Yellowjackets), Tom Kennedy, Alan Broadbent, Charlie Bisharat, Alex Acuna, Luis Conte, Paulinho Da Costa, Oscar Castro Neves, Mitchel Forman, Otmaro Ruiz, Ramon Stagnaro and Jorge Calandrelli. With so much talent gathered around Draghici’s improvisational pan flute forays and flourishes, the musicianship throughout the session is masterful while Siegel and McCauley’s acoustic jazz production is warm and organic. The set list Draghici & Company chose to reimagine consists of selections from Charlie Parker (album opener “Donna Lee”), Lee Morgan (“Ceora”), John Coltrane (“Giant Steps”), Chick Corea (“Spain”), Antonio Carlos Jobim (“Modhina” and “One Note Samba”); Michel Legrand, Marilyn & Alan Bergman and Jacques Denny (“You Must Believe In Spring”); Keith Jarrett (“My Song”), Pat Metheny (“See The World”), Bill Evans (“Waltz For Debbie”) Castro Neves (“More Than Yesterday”) and Cesar Camargo Mariano (“Curumin”) as well as Camilo’s “From Within.” Inventive arrangements chisel space in the elaborately-constructed cuts for the pan flute harmonics, genteel vocalizations and stirring melodies knitted from piano, guitar, horns and strings to effortlessly waft beauty and splendor on quieter numbers. More aggressive tracks are granted the expanse to expound dexterously on playgrounds of layered percussion and sinewy basslines. Recognized as an award-winning prodigy when he was a teenager in Romania before seeking refuge in Greece, Draghici landed a record deal after busking on the streets of Athens, garnering acclaim in Europe. He’s toured with an array of signature artists that spans James Brown, Joe Cocker, Cyndi Lauper, Shaggy and Gypsy Kings. In 2006, he formed Damian & Brothers with “his gypsy brothers,” adopting the purpose of changing the perception of gypsy music globally. They toured extensively throughout Europe performing over 600 concerts in three years. Draghici now splits his time living in the valley near Los Angeles and abroad. For more information, please visit www.DamianDraghici.com. “When I started the Rippingtons, I never imagined it would last more than the release of one album, let alone thirty years!” recalls Russ Freeman, leader and founder of the pioneering, GRAMMY® nominated group The Rippingtons, who are celebrating their 30th anniversary year with the release of True Stories, the band’s 22nd recording to be released June 24, 2016. True Stories, recorded over an intensive three-month span, is a refreshing elixir that will delight devout fans of The Rippingtons and attract new ones. Joined by original Rippington, alto and soprano saxophonist Brandon Fields, drummer Dave Karasony, bassist and rhodes player Rico Belled and special guest Jeffrey Osborne, Freeman orchestrates ten compelling originals. The album opens with the hypnotic and scintillating “Wild Tales,” the CD’s first single, which Freeman calls an “experiment in randomness.” Fusing elements of jazz with traces of EDM and world influences, The Rippingtons foreshadow the journey ahead and promise it to be nothing short of exhilarating.Many of the classic Rippingtons hit repertoire prominently feature rich saxophone melodies and this time out Freeman showcases his unparalleled guitar wizardry. On True Stories his choice of axe is a Patrick Cummings gold custom Brian Moore 30th Anniversary Russ Freeman model guitar. He plays it on all the album tracks with the exception of “Wonderland,” which features a Rosewood Fender Telecaster. The epic number transports listeners through several breathtaking, suspenseful movements that are crystallized by Freeman’s beautiful and intuitive playing. He cites this song as his favorite on the CD and you can hear the love he pours into each unforgettable moment. Amazingly, the song was recorded in one take. “I’m a big believer in first takes and stream of consciousness,” explains Freeman. “There’s something in the DNA of a first take that I find fascinating. The raw ideas are always hidden in there.” The swooning and uplifting “Sundance,” follows featuring the lyrical saxophone Brandon Fields and blues-filled and rockin’ and guitar lines of Freeman. “Sundance reminds me of the hard work of songwriting. Sometimes you have to make yourself grind it out and you get lucky. This song is perfect for the live band,” shares Freeman who will be taking True Stories on the road this Summer. Devoted fans of the The Rippingtons are well acquainted with the band’s beloved, spunky and funky mascot, the Jazz Cat, who has graced all 22 album covers. “I love the outlandish graphics which were intentionally calibrated. I was specific about wanting octopus tentacles for the Jazz Cat and gave designer Bill Mayer the backdrop of 40s era comic books, preferably set to the landscape of Mars,” laughs Freeman. Now who said jazz has no sense of humor?! “Musical inspiration is a triage of sonics, melody, and visual reference,” states Russ Freeman. His approach to composition is similar to that of a mixed-medium painter, in which he engages all the senses and employs disparate techniques. Hurling unique instrumentation, wide-ranging dynamics and contrasting textures upon his auditory canvas, he pushes the boundaries sonically, harmonically, rhythmically and emotionally. Freeman, who got his big break early on as a composer, understands how important the right elements are to create the perfect musical climate. In fact, Freeman and the Rippingtons have been known to work with The American Association of Music Therapy to conduct clinics in therapeutic settings, using their music as a therapeutic tool. The Nashville born, LA based guitarist began studying classical guitar at age eleven and picked up the guitar four years later. Such iconic players as Larry Carlton, Wes Montgomery, George Benson, Paco de Lucia and James Taylor, among others, have influenced Freeman’s own distinctive style through the years.“I have always attributed the band’s success to our loyal fans,”says the humble maverick. A testament to Freeman’s Midas touch and the reverence his peers have for him is the who list of stars who have been featured with The Rippingtons through the years. Some of those artists include vocalists Patti Austin, Jeffrey Osborne and The Whispers, pianists Bob James, Joe Sample and David Benoit and saxophonists Kenny G, Jeff Kashiwa, Paul Taylor and Kirk Whalum, to name a few. Freeman’s dynamic and adventurous compositions have long been a centerpiece of The Rippingtons’ signature sound. “Once I learned to free myself from self imposed constraints, I found new ways to express ideas musically,” explains Freeman. The Rippingtons’ irresistible auditory confection has catapulted their albums to the top of the charts time and time again. In fact, virtually all of their recordings have hit Top 5 on the Contemporary jazz charts and several have landed #1 albums including Welcome To the St. James Club, Curves Ahead, Tourist in Paradise, Sahara and Black Diamond. “I try to always respect the limited time we have, and treat each day as the last,” shares the visionary and virtuosic guitarist, keyboardist, composer and producer. This mindset, spiritual grounding and deep understanding of how to operate in gratitude, has allowed the multi-instrumentalist to explore the realms of possibility, making him a pioneer in the music game. Russ Freeman has made a name for himself defying the odds and redefining himself every step of the way and he’s not done yet. True Stories is a testament to the unwavering artistry of Russ Freeman and The Rippingtons and confirmation that there are still many more tales to be told. “I’m trying to reach for a place I have not been. I’m looking for inspiration. I never look back. ”It is this forward momentum that propels the notes on True Stories and keeps the listeners yearning for the next chapter. Los Angeles, Calif. (25 May 2016): Message to funk received from the Mothership: hit-maker Brian Culbertson is in the studio conspiring with his cosmic group of musical soul brothers on his second funk collection, “Funk!,” which will be released September 16 on his BCM Entertainment label. Less than a week after his seventeenth album streets, the award-winning multi-instrumentalist will launch a coast-to-coast concert tour on a scale unlike any trek ever mounted by the vivacious showman who will be flanked by the same band showcased on the album. To help set the stage for the 11-song set plus three playful interlude sketches, all produced by Culbertson, radio stations will be serviced “Been Around The World” in early July. Those who have caught a Culbertson show over the last year might have had a premonition that the R&B-jazzman was about to again morph into an emissary of funk, a mission that began with his 2008 recording “Bringing Back The Funk,” which he co-produced with the late Maurice White of Earth, Wind & Fire and featured legendary funksters Bootsy Collins and Larry Graham. His set list at recent gigs included a pair of funk classics, “Got To Give It Up” and “Play That Funky Music,” which made it onto the new album. The Chicago-bred musician who plays piano, Fender Rhodes, Wurlitzer, clavinet, Hammond B3 organ, synths, trombone, bass, drums, percussion and sings on the entire record wrote or co-wrote nine new songs for “Funk!” that showcases his live band – Marqueal Jordan (vocals & sax), Tyrone Chase (guitars), Eddie Miller (keyboards, organ & vocals), Rodney Jones, Jr. (bass, guitar & vocals), Chris Miskel (drums) and Michael Stever (trumpeter & horn arrangements) – along with Chance Howard, a nasty R&B keyboardist, bassist and vocalist who has toured and recorded with fellow Minnesota native Prince. Noted trumpeter Patches Stewart will replace Stever for the Funk! Tour. Next month, Howard will join Culbertson on stage to premiere a few choice cuts from “Funk!,” including the first single, at Culbertson’s fifth anniversary Napa Valley Jazz Getaway, a wine and jazz lifestyle experience in the heart of California Wine Country taking place June 8-12. “The concept for ‘Funk!’ was to make an old-school, throwback funkadelic record in the style of P-Funk meets Prince and to tour with the same band that appears on the album – my band plus Chance (Howard). We finished tracking and are mixing this week. The show we will be taking out on the road is unlike anything anyone has ever seen from me before. It’s on an entirely different level. Yes, we’re taking it there! I’m also very excited about capturing the magic by shooting a Blu-ray to be taped on tour this fall,” said Culbertson, who as an imaginative and trend-setting artist, producer and songwriter has architected 28 Billboard No. 1 singles along with a library of chart-topping albums. Tickets go on sale for the Funk! Tour for fan club members beginning June 1 and to the general public starting June 3. For more information, please visit www.BrianCulbertson.com. MINNEAPOLIS (6 June 2016): Known for consistently cranking out chart-topping singles that deploy big vibrant pop hooks, contemporary jazz saxophonist Steve Cole conjures a sonic escapade with the hypnotic “Mirage,” the first single from his forthcoming eighth album, “Turn It Up,” which will be released July 15 by Artistry Music. Radio programmers were instantly spellbound, making the track from the David Mann-produced set of R&B grooves and soul-powered sojourns the No. 1 most added single on the Billboard BDS chart. The entrancing single on which electronic beats bombard the senses before chill tenor and soprano sax leads and a soothing trumpet undercurrent take command of the illusion is one of nine new songs on the session, eight of which were composed or co-composed by Cole. The tune reflects his hometown roots and ardor for Chicago’s dance music scene. It’s one of three major cities that helped shape the collection. “I embarked on ‘Turn It Up’ with the goal of making music with great musicians and great friends in great cities. This time around I wrote much of the music with Dave Mann in New York City. We recorded horns, guitars and vocals there as well. The energy in that great city was truly inspiring and it really is reflected in the music. Next stop was Minneapolis, where I worked with the great keyboardist and producer Ricky Peterson. Ricky and I wrote the song ‘Workhouse’ together, a track influenced by our love of Chicago house music. Dave joined us later in Minneapolis to record Ricky on the Hammond B3 organ as well as to record my Chicago pals, bassist Lamar Jones and drummer Khari Parker. I decided to track all of the saxophone parts in Minneapolis as well,” explained Cole, who has a slate of festival and club dates running into mid-October to help support the album release. Cole and Mann have been collaborating ever since Cole’s sophomore record, “Between Us” (2000). In addition to helming the production on “Turn It Up,” multi-instrumentalist Mann often shadows Cole on alto and soprano sax to add depth, thickness, volume and intensity to the layers upon layers of horns – alto, tenor and soprano saxophones, trumpet, trombone and flute. Aside from the back-to-back dance music workouts that close the album, Cole’s energizing pop melodies and hooky harmonies on the disc are presented as soulful R&B joints. The saxman dusted off Bobby Womack’s “Woman’s Gotta Have It,” teamed up with fresh-faced keyboardist Nicholas Cole on “Turn It Up!” and yielded the spotlight on “Bright Side” to Pieces of a Dream’s James Lloyd, the author of the sunny mid-tempo smile, who solos on piano. Cole’s 1998 award-winning arrival onto the contemporary jazz scene was the Brian Culbertson-produced “Stay Awhile” that spawned a pair of No. 1 singles. Solo tours and prominent sideman gigs with Culbertson, Boz Scaggs, Rick Braun, Peter White, Jeff Lorber and Larry Carlton served to rapidly multiply his fervent fan base exponentially while successive albums and singles repeatedly took Cole to the top of the charts, establishing him as a radio playlist favorite. In addition to his own recordings, Cole records and performs regularly as a member of Sax Pack, an all-star sax combo consisting of rotating members Jeff Kashiwa, Kim Waters, Jackiem Joyner and Marcus Anderson. For more information, please visit www.SteveCole.net.